Arsene Wenger’s men will be looking to build on their solid start to the season. 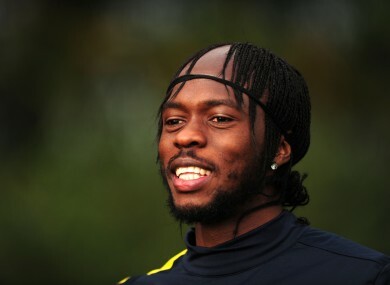 Gervinho is likely to start for Arsenal tonight. OLYMPIAKOS ARE THE visitors to the Emirates Stadium on Wednesday as Arsenal bid to recover from their first defeat of the season. In a sharp contrast to their shambolic performances early last term, Arsene Wenger’s team have made a solid start to the 2012/13 campaign. They won two and drew three in the English Premier League, including a credible 1-1 draw away to champions Manchester City, while beating Ligue 1 title-holders Montpellier away from home in the Champions League. But the first defeat arrived at home on Saturday, with Chelsea registering a 2-1 win at the Emirates thanks to goals from Fernando Torres and Juan Mata. Former Lille forward Gervinho and Germany international Lukas Podolski were preferred in attack to misfiring close-season signing Olivier Giroud. And after losing star striker Robin Van Persie to Manchester United, Arsenal’s lack of options up front were painfully apparent against Chelsea. Midfielder Abou Diaby has impressed greatly since returning from injury during the first weeks of the campaign. But the powerful Frenchman is now back on the sidelines again after picking up a thigh problem early in the match against Chelsea. Nevertheless, Greek side Olympiakos are not expected to pose their Premier League hosts a significant problem in north London. Coached by Portuguese Leonardo Jardim, Olympiakos are three points clear at the top of the Greek Super League after five matches of their domestic season. They will bring with them a face familiar to fans of English football, with former Manchester United and Derby County goalkeeper Roy Carroll between the sticks, as the Northern Irishman enjoys an unexpected late career revival with the Athens giants. Also in Group B, German club Schalke await the visit of Montpellier to the Veltins-Arena. Surprise Champions League semi-finalists in 2010/11, Schalke had to settle for the Europa League last term, which they exited at the hands of beaten finalists Athletic Bilbao in the last eight. Huub Stevens’ side are fourth in the Bundesliga, level with defending champions Borussia Dortmund but already seven points back from leaders Bayern Munich. Their opponents, Champions League debutants Montpellier, staged a considerable upset to beat Paris Saint-Germain to the Ligue 1 crown last term. But their early efforts in defence of the title have been unconvincing at best, with Montpellier 13th on the table, already 10 points adrift of leaders Marseille. And with domestic matters proving a challenge for Rene Girard’s men, the Champions League may quickly be deemed an unwanted distraction at the Stade de la Mosson. Email “Champions League Group B preview: Arsenal await in-form Greeks”. Feedback on “Champions League Group B preview: Arsenal await in-form Greeks”.